PROFILE - WWII LIBERTY SHIP. Image courtesy of Navy History - Oilers. TOP-O-SHIP WWII LIBERTY SHIP. Image courtesy of Navy History - Oilers. 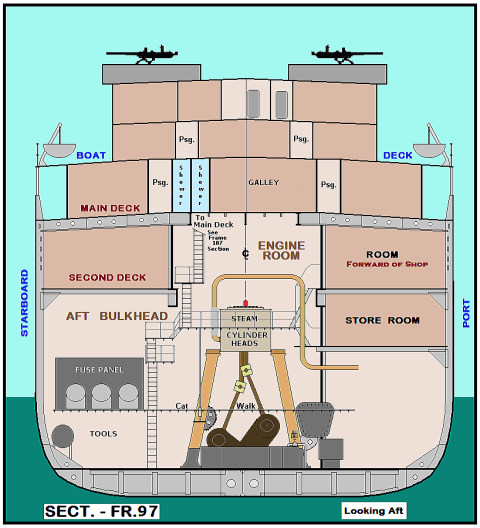 UPPER MID-SHIPS DECKS - WWII LIBERTY SHIP. Image courtesy of Navy History - Oilers. 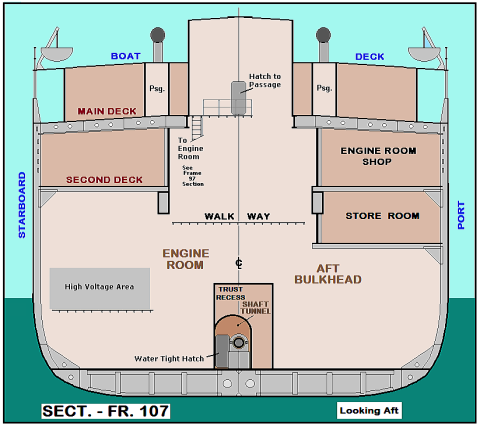 MAIN DECK - WWII LIBERTY SHIP. "A" GUN MOUNT, MAGAZINES "E" MAIN ENTRY TO SHIP. "B" WARPING WINCH AREA "F" FREEING PORTS. "C" CARGO HANDLING STATIONS "G" WINCHES, CARGO. "E" MAIN ENTRY TO SHIP. "M" GUN MOUNT - BOW. Image courtesy of Navy History - Oilers. SECOND DECK - WWII LIBERTY SHIP. 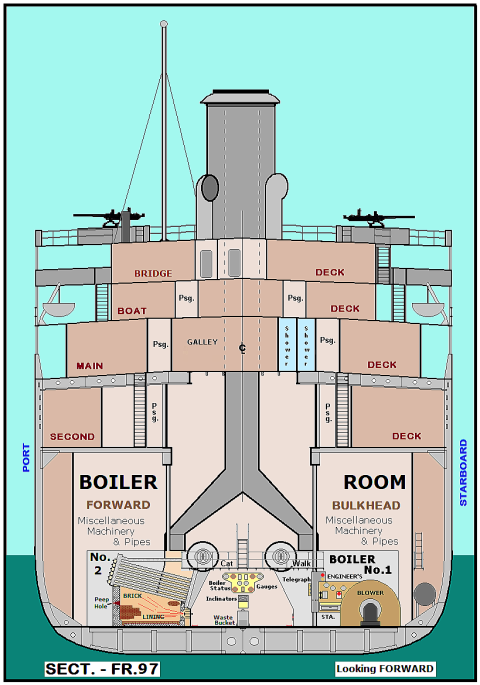 "B" AREA ABOVE ENGINE ROOM. "C" CARGO HOLD - TYPICAL. "D" CHAIN LOCKER - BOSN'S LOCKER - CARPENTER SHOP. INNER BOTTOM - WWII LIBERTY SHIP. 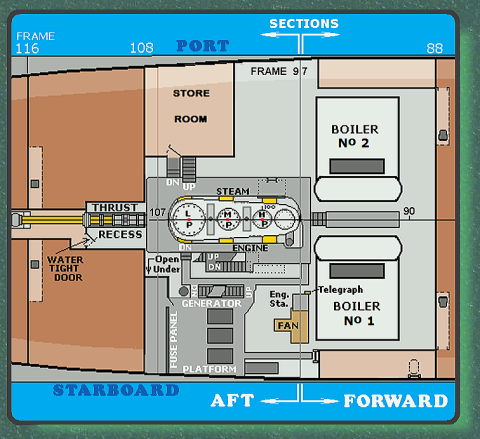 "B" ENGINE ROOM or FIRE ROOM. 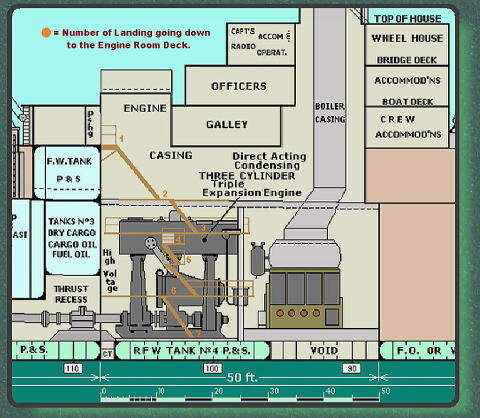 ENGINE ROOM DETAILS - WWII LIBERTY SHIP. Image courtesy of Navy History - Oilers. 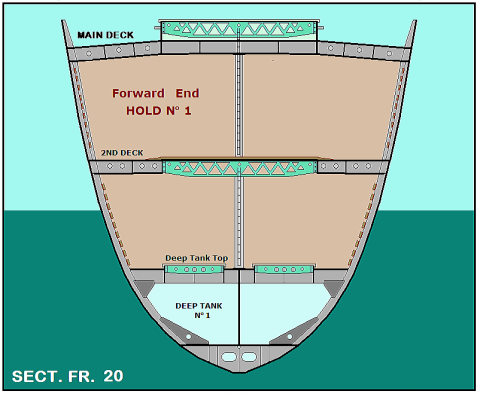 SECTION 20 - WWII LIBERTY SHIP. Image courtesy of Navy History - Oilers. 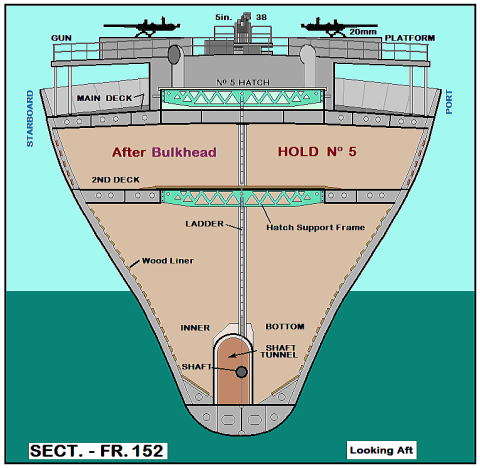 SECTION 97 FOR & AFT - WWII LIBERTY SHIP. Image courtesy of Navy History - Oilers. SECTION 107 - WWII LIBERTY SHIP. Image courtesy of Navy History - Oilers. SECTION 152 - WWII LIBERTY SHIP. Image courtesy of Navy History - Oilers.